Originally posted: May 12, 2018 . Last modified: February 6, 2019 . 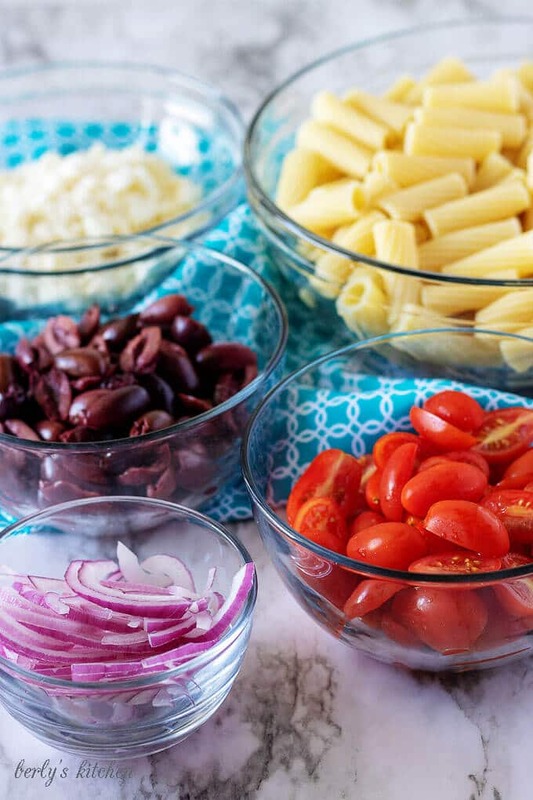 Our easy Greek pasta salad is simple to prepare but still comes loaded with homemade flavors. The red wine vinaigrette highlights all those great Mediterranean ingredients. We can’t wait for you to try it! Before you say it, I know, it’s not authentic Greek pasta salad. With that being said, it’s still delicious and isn’t that what really matters? One thing I’ve learned about blogging is that once you put yourself out there in the public eye, everyone has an opinion that they think matters. Sometimes, that’s a good thing, other times, not so much. However, social media and proper upbringing have armed most of us with tools to either ignore or address these comments with tact and taste. Speaking of taste, why don’t we move on to why you’re really here, the food. Let’s get started! First, cook your pasta per the box instructions and slice your olives, onions, and tomatoes. Make sure to run cold water over your pasta noodles and drain them before setting them aside. Next, make your vinaigrette by combining the olive oil, red wine vinegar, garlic, sea salt, black pepper, oregano, lemon juice, and lemon zest. Mix everything well to create the vinaigrette. I use a mason jar with a lid to create my dressings. Toss everything into the jar, seal it up, and shake vigorously for 20 seconds, done and done. Then, in a large mixing bowl, combine the noodles, feta cheese, tomatoes, olives, and red onion. Last, toss the pasta salad ingredients with the dressing and serve. Once the noodles have finished cooking, drain them, then run cold water over them for 60-90 seconds to cool them off. This will stop the cooking process and keep the pasta from becoming gummy and overcooked. Due to the salty nature of feta cheese and brined olives, this dish can get “over-salted,” real quick. I recommend starting with the teaspoon of salt in the dressing. Then after everything is tossed together, taste testing the dish, then adding salt if needed. I see a lot of recipes that call for cucumber and other veggies. Don’t be afraid to experiment with other ingredients. Not everything has to be authentic, all that matters is that you and your guests enjoy the meal. Need a great side dish for this recipe? Then check out or Feta Mozzarella Topped Cheesy Bread or our Garlic Knots. 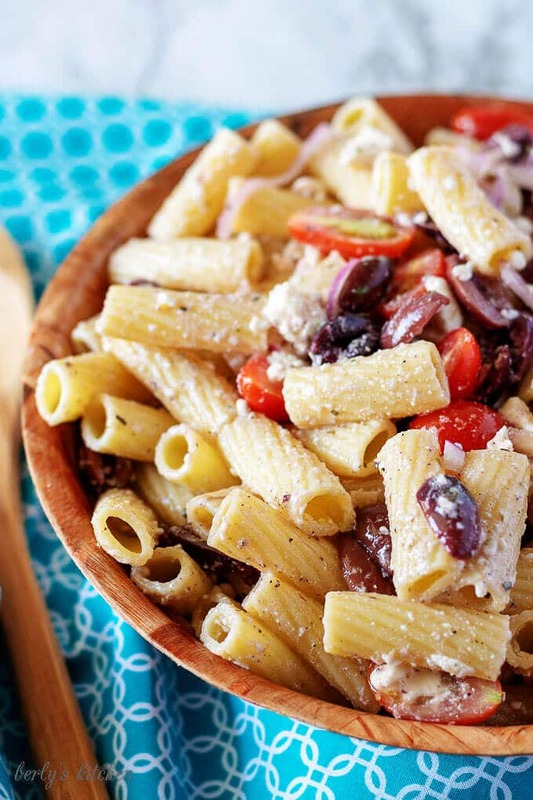 Our easy Greek pasta salad is simple to prepare but still comes loaded with homemade flavors. The red wine vinaigrette highlights all those great Mediterranean ingredients. We can't wait for you to try it! First, cook your pasta per the box instructions and slice your olives, onions, and tomatoes. Next, make your vinaigrette by mixing together the olive oil, red wine vinegar, garlic, sea salt, black pepper, oregano, lemon juice, and lemon zest. The calories listed are an approximation based on the ingredients and a serving size of 3 ounces of pasta. Actual calories will vary. 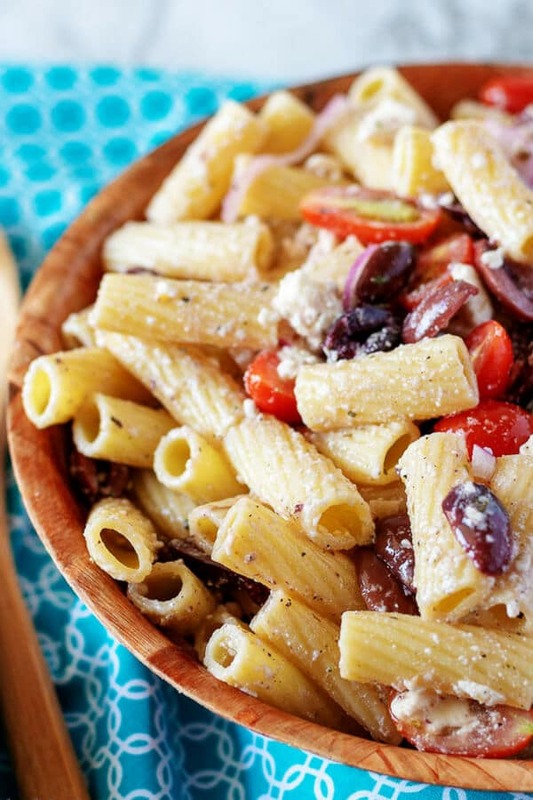 The Greek pasta salad can be stored in your fridge for up to 3 days in a sealed container. 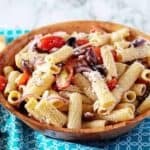 When I make this delicious Greek pasta salad for hubby, he is going to do cartwheels in happiness and I’ll be cartwheeling right beside him too! It looks so delicious and full of flavor!! 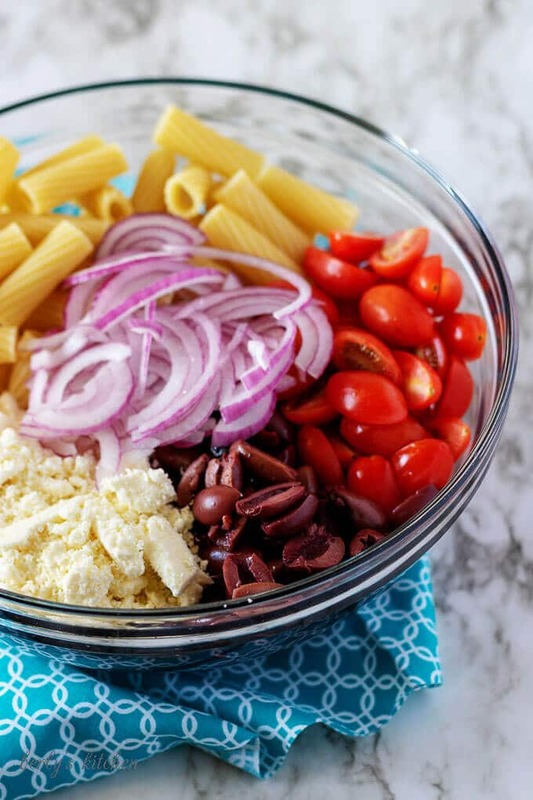 I would eat this delicious Greek pasta salad all by itself as a meal. It’s so loaded with vegetables and feta goodness I wouldn’t need anything else with it. Wow!! I just love this one Kimberly. This will be a must try for us. Love the homemade dressing. I love any type of Greek salad! In my home town of Panama City we have a Greek restaurant that a very similar salad and I tried to make it. I can’t wait to try yours! What a beautiful pasta salad! And just in time for all those summer picnics! Can’t wait to try it! 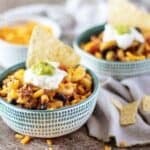 I love olives – the more recipes that use them, the better! This looks so great for summer picnics. I think Pasta Salad is always a winner in summer. Everyone loves a light refreshing and still fulfilling dish like a salad with pasta. I always choose to take pasta salad when I have to bring something for a BBQ Party. I love greek anything!! And it’s spring going into summer and pasta salad is PERFECT for this time of year! Love the encouragement of using different vegetables! Thank you, Amanda! One of the great things about cooking is that you can make substitutions that appeal to your tastes. So, in my opinion, go crazy lol! 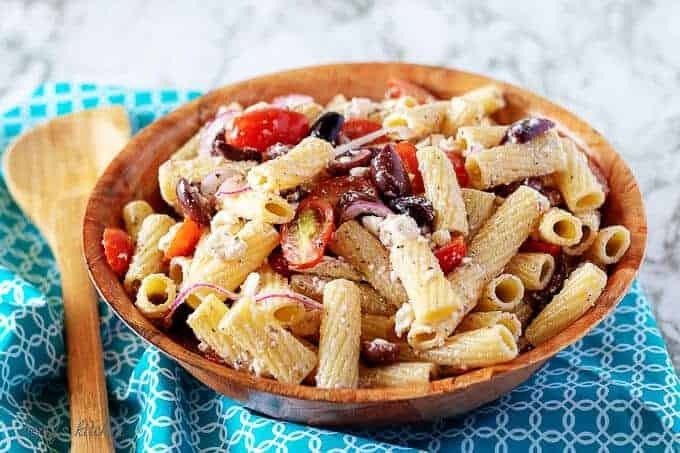 This Greek Pasta Salad looks so yummy! Perfect for summer barbecues and great for parties. Simple and perfectly seasoned! Love easy pasta salads like this, especially during the summer! So yummy. Can’t wait to try this one out!